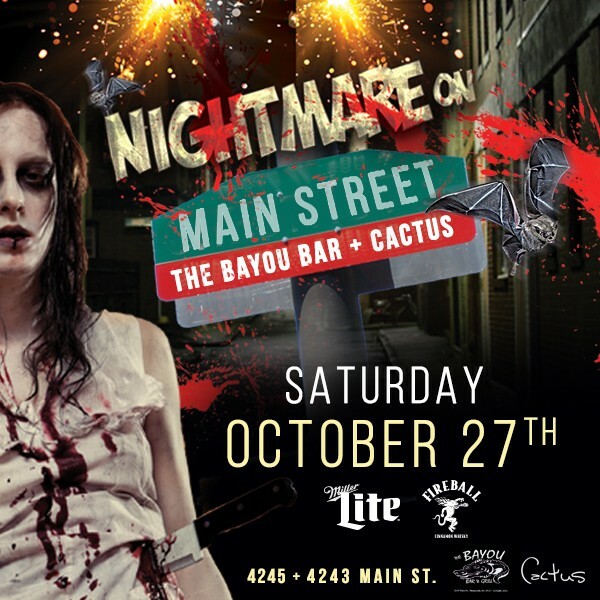 Terror and fun awaits at this year's 2-venue spine-chilling Nightmare on Main St. Halloween party at The Bayou and Cactus Cantina! Come out and join the rest of the ghostly partygoers in Manayunk as we transform both venues into a true Halloween scream. Here's what's in store - VIP Open Bar, Drink specials, costume contests, DJ Dubz for a guaranteed thrilling time!! Tickets will be available for purchase at the door only if the event does not sell out in advance. NOTE: Tickets for open bar will NOT be available at the door. Prices will increase as we get closer to the event and will be more at the door. So, for guaranteed entry and to save $$, absolutely purchase your tickets ASAP before the price goes up or the event sells out! Exclusive to Manayunk - the best value around! When you buy your advance online ticket to one of our Manayunk parties, it grants you access to Bourbon Blue, JD McGillicuddy's, Ryan's Pub, CRAFT Manayunk, The Bayou, and Cactus Cantina - no additional cover charges to pay all night long. Plus, enter Mad River by 11pm for no cover as well (after 11pm, cover charges apply at mad river). You MUST check in at the location you bought tickets to. You cannot get an open bar or free drink at any other venue other than the one you bought your ticket to, but you can freely go to any of these bars with your wristband throughout the night. Costume contest categories with prizes for: Sexiest Costume, Best Group Costume (3 or more people), Best Individual Costume. Staff will be walking around all night checking everyone out and seeing who the best of the best are - dress to impress to win! They will be handing out tickets for the top costumes - that ticket will get your entered in to the contest (ask the staff when the contest will be so you do not miss out). Since September '93, The Bayou Bar & Grill has become a staple of Manayunk's unique neighborhood atmosphere. Located on Main Street, the Bayou is popular year-round, to watch football in the fall, baseball in the spring or relax at the outdoor cafe in the summer. The Bayou is the #1 spot for drink specials and happy hours in Manayunk.